Happy Halloween to all the ghosts and goblins out there! As is my tradition, I strive to do decent jack-o-lantern carvings and each year attempt a theme of sorts. Usually it isn't solely comics. I usually only have one comic lantern each year, what I call 'my pumpkin'. But this year is the 25th anniversary of Batman the Animated Series and I thought what theme could be better. 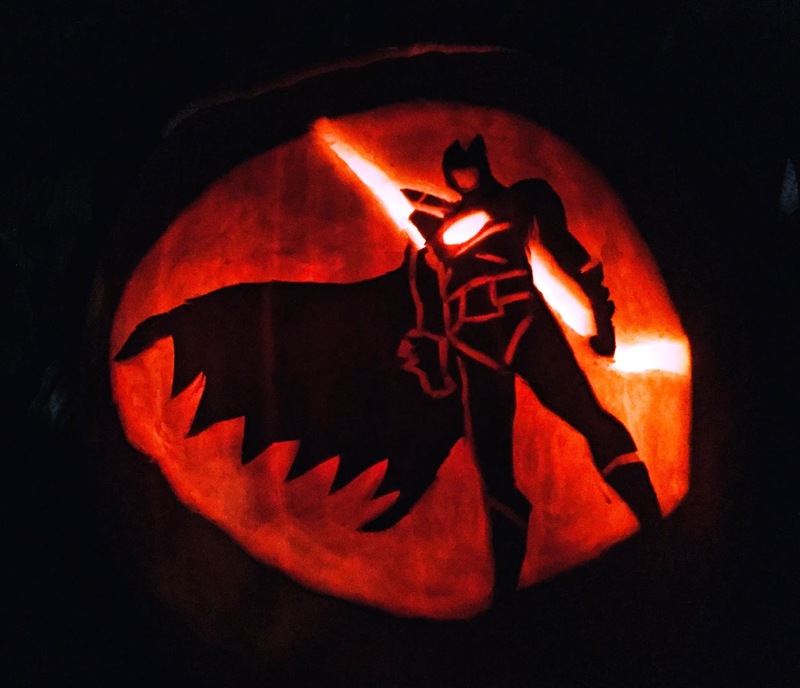 With a couple of nephews who are all into Batman these days, I decided I'd get carving. I hope these turned out okay. I wanted to do something a bit art deco for the 'main' pumpkin, something sort of daring and risky. I felt that end image of the opening when the lightning bolt lights up Batman is so iconic that it would be the ultimate homage. This was tough for a couple of reasons. For one, I drew the stencil on backwards from the show opening, a rookie mistake. But then trying to decide what would be carved, uncarved, and through was a challenge. I needed to add details so people would know this was Batman. I am on the fence about this one, not sure if I am happy with it or not. Tonight on the CW, the Supergirl show will air an episode titled 'The Faithful' about a cult of people in National City who begin to worship Supergirl as a deity. This isn't the first time that Supers being viewed as new Gods has happened. From Countdown to the DCEU to innumerable other examples, superheroes being looked upon as the holy is well trod ground. And, in fact, it has happened in the past for Supergirl. 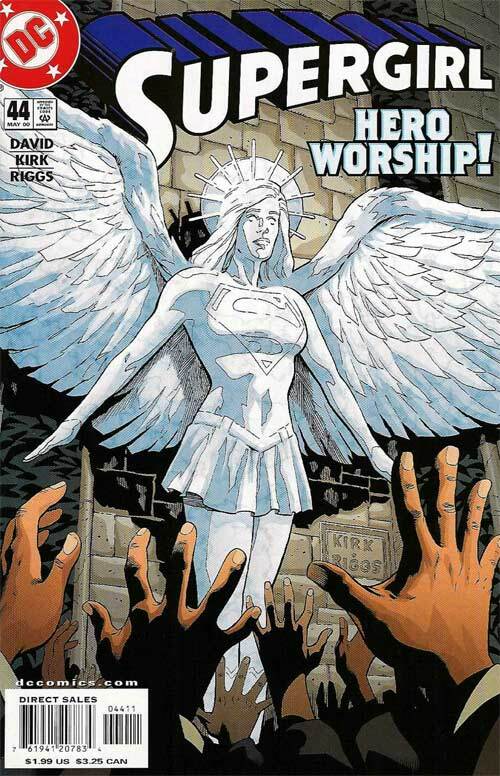 Peter David's Supergirl run (in Supergirl volume 4) had faith and religion and sin and redemption as major themes running through the book. Frankly, those concepts made up the bulk of the first 50 issues, a long form run on comics that I hold up there with the best comics can offer. 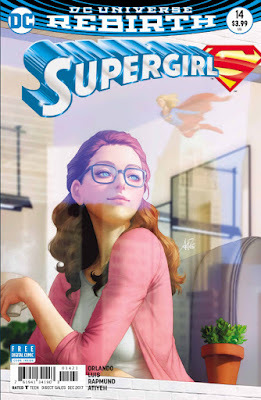 Now much of that had to do with the redemption of Linda Danvers, the angelic nature of this new Supergirl being, her own hubris leading to a downfall, and then her ultimate self-forgiveness. But given the fact that this Supergirl said she was an angel, it wasn't surprising that a Supergirl religion would arise. In fact, this faith impacted her greatly, making her wonder about who she was and what her place was in the world. It turns out, it impacted her negatively, another way to try to break her spirit. I have praised this run throughout this blog's lifecycle, but Supergirl #44, Shadows of a Doubt, is definitely a strong issue with powerful moments. David, and long time art team of Leonard Kirk and Robin Riggs, bring all the power to bear, giving us character moments, soulful moments, and even a super-powered brawl. But it all revolves around this Supergirl cult, perfectly captured on that cover with a deified statue of Supergirl being praised by the congregation. 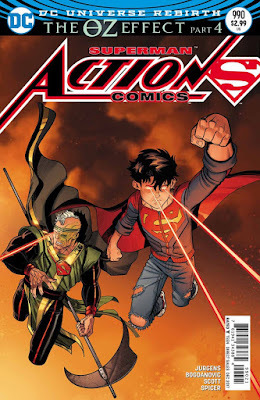 Action Comics #990 came out this week, the fourth part of The Oz Effect storyline and a surprisingly effective issue building up the threat and suspense of Jor-El's plot. I have to admit, much like last issue, the plot doesn't move forward much this issue. But what the plot does is deepen. You see just how strange Jor-El's plan is. This man has absolutely no respect for human life at all, willing to let followers kill themselves with barely a notice. And we get to see just how far Superman will go to preserve human life, to the point of perhaps extending his reach more than he usually does in controlling human events. When you add those two things up - Jor-El's warped thoughts and Superman's pledge to the never-ending battle - and you get a very good issue. Writer Dan Jurgens does a very good job here, leaning into some popular Superman tropes as he moves closer and closer to faceoff with his presumed father. And he doesn't make Jor-El completely evil. The ends here are noble. The means are horrible. The specter of Dr. Mahattan is there in the background. But, like some commenters here, I am getting somewhat tired with Jon being used as a pawn in villain's plots. I would have loved for Jon to simply reject Jor-El's beliefs. The art is done by Viktor Bogdanovic and he truly shines here. There is a very polished look to this book and Superman looks completely iconic. How will this all end? I am eager to find out. The DC solicits for January have come out and the super-books all look great. 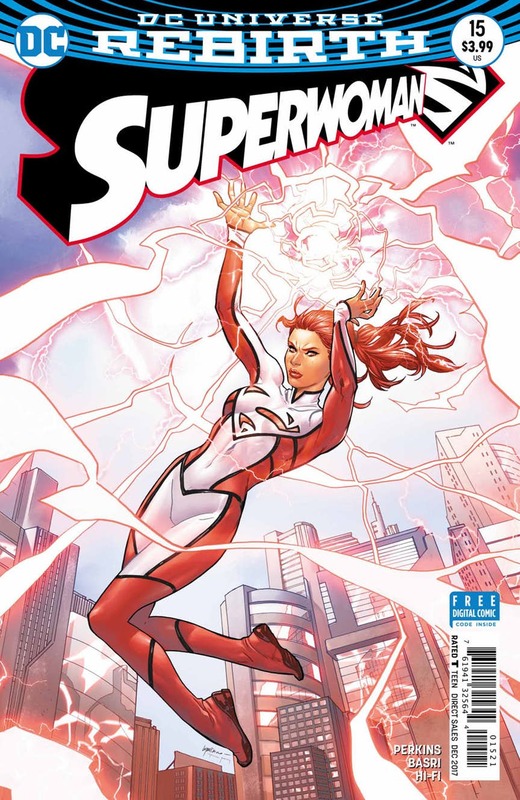 It is a bit depressing but not too surprising that we got the Final Issue death knell for Superwoman. I feel like the book came in with some decent promotion but then fizzled a bit. 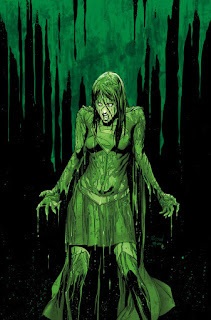 The feint of having a Lois-led book followed by Phil Jimenez's inscrutable story which ultimately was wiped from continuity made it a difficult book to really grab onto. And while K. Perkins has done yeoman's work in stabilizing the ship, I fear the sales horse had left the barn. 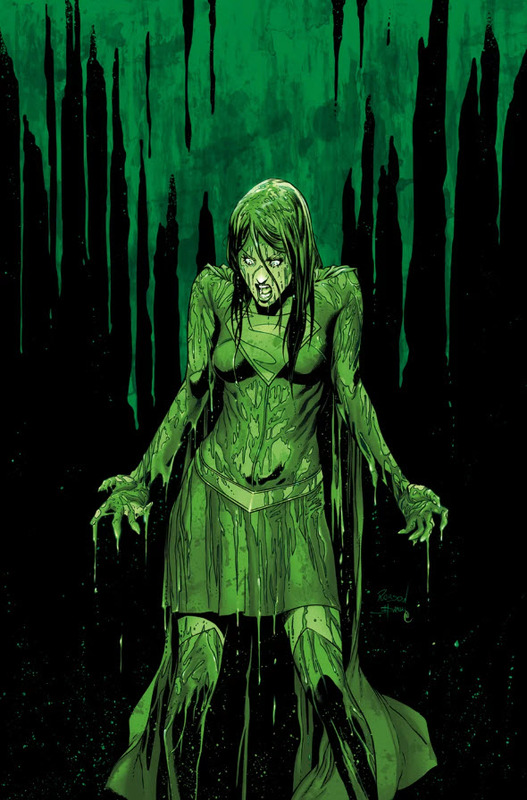 And we'll start off discussing Supergirl #17 which sports this utterly horror-drenched cover by Robson Rocha! Supergirl season three, episode three, titled 'Far from the Tree', focused on two of the supporting cast's relationships with their fathers. We certainly learned a lot about Maggie and her father in this episode, as we did with J'onn and his. Both of these relationships are struggling right now. Maggie and her father have been estranged since she came out. J'onn has thought his father has been dead. And now both are trying to salvage a relationship. There are plenty of emotional beats in this episode. And there are very strong performances from both Floriana Lima and David Harewood as they are put through the wringer a bit. And seeing Carl Lumbly, who did the voice of J'onn on the JLA Timm-verse cartoons, playing J'onn's father was awesome. And there are other moments that shine. I like how Alex and Maggie are heading towards a 'deal breaker' moment. There is a Britney Spears moment with Melissa Benoist which might be my favorite bit for the show as in total as well. But the big downside of an episode like this is that Supergirl really was pushed a bit into the background. She is part of the J'onn story but she didn't really *need* to be. And I might add that it appears she uses lethal force in the end fight despite saying 'there is always a choice' besides death in combat earlier. That didn't sit well. Lastly, there are some definite political leanings in this episode's language which stick out rather obviously. 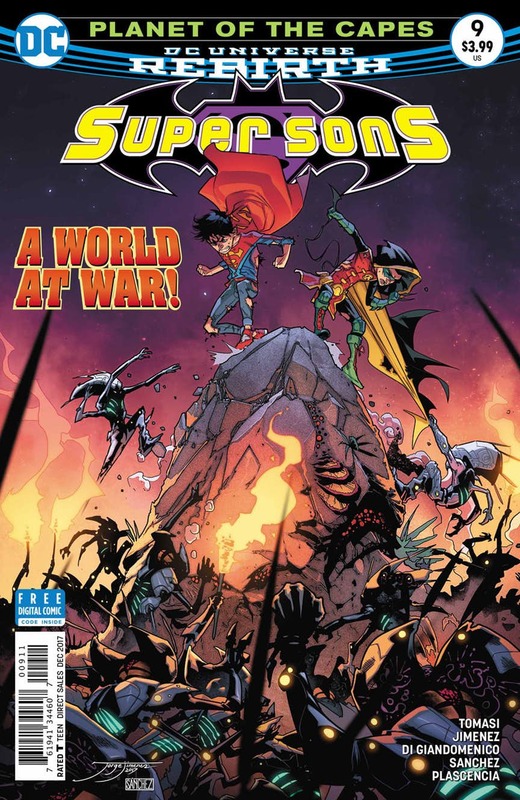 Super Sons #9 came out last week and finished the Planet of the Capes storyline. I must admit, I don't know if actually followed what the heck was happening. I don't know if I understood what the living Ygarddis was hoping for. I don't know if I understood what the motivation of Kraklow was. I don't think I got what the heroes were hoping to accomplish. What I do know is that the character moments continued to be a high point. I liked the interaction between Damian and Jon. I liked Jon starting to become an inspiration even at his early age. I liked the sons response to the end of the mission. That all worked. But the story around those moments? I'll reread the issue (again) but I don't know if I'll ever 1005 follow what was happening. The art is listed as being done by Jorge Jimenez and Carmine Di Giandomenico. There is no page breakdown so hard to know where one artist ends and the other begins. But some pages have a rougher look than Jimenez normally has so I have to assume that is Di Giandomenico. The page layouts have a similar feeling so the book sort of flows fine. The sales reports for September came out a while ago and there are some interesting numbers to report which shows just how fickle the comic market is. As always, head to ICv2 for a bigger report. 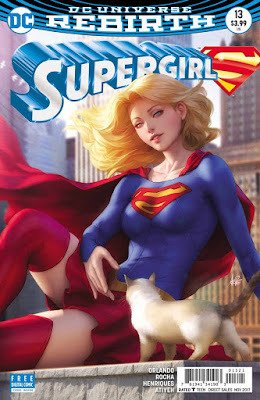 I have bemoaned a bit that Supergirl, a perfectly fine superhero book, was selling relatively low numbers. I will admit the book seemed to be trying to find itself. 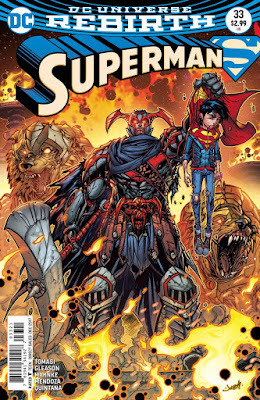 The initial Cyborg story and then the weird trip into the Phantom Zone seemed like the creative team was finding its footing and building a foundation. And I understand that 10 months is a long time to give a book (at least these days), but the title seems to have turned a corner. Wouldn't it be bad if no one was around to see it? Well, this title's super-soft reboot coincided with another change. Artgerm started to do the variant covers. And as I said, I noticed that his first cover on the book sold out at my LCS and was a wall book at a local con! Let's take a peek at sales! Superman #33 came out this week starting the Imperious Lex story arc and I have to say I was somewhat tickled pink by this opening issue. There were a bunch of small little nods and mentions and interactions that really grabbed me a bit as a reader, especially an older reader. As usual, writers Peter Tomasi and Patrick Gleason also bring a nice look at the Kent family while weaving in some high adventure. There are definitely a couple of things which I still am getting used to. The idea that Lex is a hero and working side by side with Superman is still odd to me. And this issue and this story has that in spades. I wonder if this story might be the tipping point to bring Lex back into the villainous fold. There also are some nods that maybe Lex is a bit starstruck by hanging out with Superman. And maybe Superman is the obnoxious popular high school kid who hangs with a 'loser'. The dynamic subtly permeates their interactions. I also have to get used to the fact that Darkseid is a kid in Wonder Woman and not on the throne of Apokolips. As a result, there is a power vacuum on that world. You would think that now would be the time for New Genesis to attack! That said, between the 'Darkseid Is'-ness of Mister Miracle and the wackiness of Bug!, I realize that I need to put the continuity nerd inside my head away. I will continue to compliment Doug Mahnke for his tremendous work. His work seems so effortlessly fantastic. His work just flows. And I am always impressed when an artist brings the same elan to quiet character moments and the action sequences. New Super-Man #16 came out last week so forgive me for taking a bit to get to it. Of course, DC releasing 4 super books in the same week makes reviews tricky. Writer Gene Luen Yang seemed to hint on Twitter that this book was going to be cancelled but then he sent out another tweet hinting that maybe it is sticking around. And that makes me happy because this book has been an utter delight. 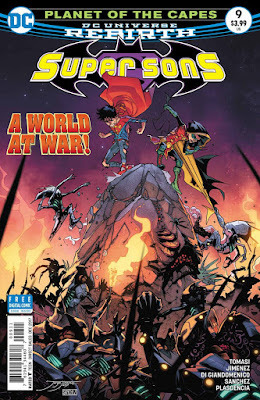 From the Kenan's mix of being sad and a bully and silly to the Chinese interpretations of the JLA to the exploration of Chinese mythology, it has all worked. And it has worked incredibly well. This issue really focused on another aspect the book has been tiptoeing around, the misrepresentation of Asians in comics. And again, it is done so very well, leaning into DC's own history. We saw the dreaded Phuey En Yui earlier in the series. Here we head straight into Detective Comics #1. The art is done by Brent Peeples. It isn't the smooth, polished look of Philip Tan but it is fine. Peeples seems to be improving with each issue. In particular, his aping the style from those early Detective Comics issues is spot on. Last week, Supergirl season 3 started with a very solid premiere, sowing some plot seeds, introducing us to the big bads, and giving us excellent character moments for both Kara and the primary supporting cast. This week the second episode, 'Triggers', aired and built on that foundation. 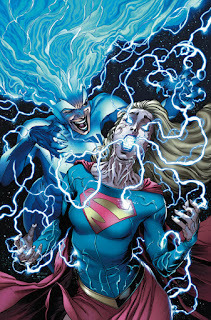 And we got old-school Supergirl villain Psi to come in to challenge the Girl of Steel. This season is truly off and running. One thing that I very much liked about this episode was that the emotional anguish that Kara was feeling in the premiere is still present. Yes, she is working through her grief. But one night of apps at the alien bar (as last episode closed) isn't going to alleviate all her pain. This sadness and anger and (as it turns out) fear runs too deep to be so easily 'cured'. As usual, Melissa Benoist brings it, showing us all the emotions Supergirl is feeling. And as a bonus, we get extra Danvers sisters scenes. As I said last before, season 2 didn't give us enough of these two. Benoist and Chyler Leigh have such easy, breezy chemistry. Why not take advantage. But as much as I loved the character stuff, the fanboy in me squealed a bit to hear about Gayle Marsh from Skokie, Illinois. How far have we come as Supergirl fans that Psi and her particulars were on a television show?? And Yael Grobglas plays her with such a cold, calm, and cruel, observing all she does with just a hint of enjoyment. It makes me happy. Superwoman #15 came out last week and was another very interesting issue in this run by writer K. Perkins. I am an unabashed Lana fan and I have been very intrigued in seeing her as a super-hero. I sort of suffered through the slapdash, ill-focused early run of the book. And Perkins has done her best to try to shore this book up. Lana is much more likeable under her pen than she was before. This book has always been about Lana discovering herself and dealing with her personal issues. And it was feeling like Perkins was bringing Lana to a place of stability. She was dealing with her anxiety. She was reconciling with Steel. She found out her powers were from Red K exposure. Turns out that stability was a fake-out. Lana is back on unsteady ground again. And while I understand all too well that life's ups and downs can bring peaks and valleys in your personal life and sanity, I keep hoping this book gives Lana a chance to breathe a bit and just do some heroing. The art on this issue is by Sami Basri, someone I know mostly from the tail end of the last Power Girl book. It has a slightly cartoony, slightly anime feel to it but it works. And heck, I haven't even talked about the new villain or the guest stars in the book. Let's get there! Action Comics #989 came out last week, the third part of The Oz Effect storyline. While the book is a good issue with wonderful art by Viktor Bogdanovic, it only slightly moved the story forward and the big step is basically the ending splash page. Writer Dan Jurgens lays it all out again. We know Mr. Oz is Jor-El. We know he is manipulating the Earth so a lot of ill will is churning and a lot of disasters are transpiring. We know that Superman is questioning if Oz is his father. We know that Superman believes in Earth and won't quit his mission. And we know this all over again because those points are repeated here. There are a couple of new wrinkles, especially as I scratch my head over what Jor-El's plans are. But overall this is just representing, and maybe strengthening, the existing plots. I have liked Bogdanovic's art since his time on New Super-Man and he continues to shine here. There are nice page layouts and solid panels. 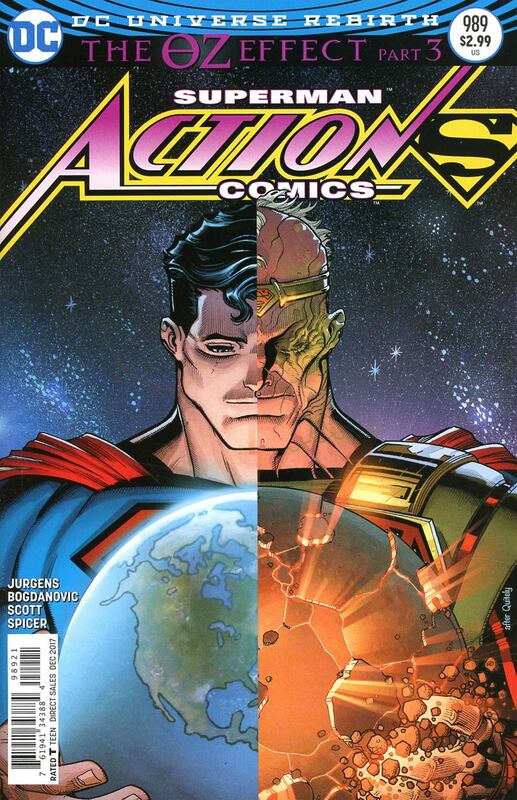 And there is a nice cover by Brad Anderson and Nick Bradshaw, a nice homage to the classic All-Star Superman #10. Supergirl #14 came out this week and was a nice crossover event between members of the Superman family. Frankly, that word family needs to be part of the Superman mythos. Unlike the face-peeling, emotional trauma of the Batman Family, I want ... no I need ... the Superman family to act like loving colleagues, like family. 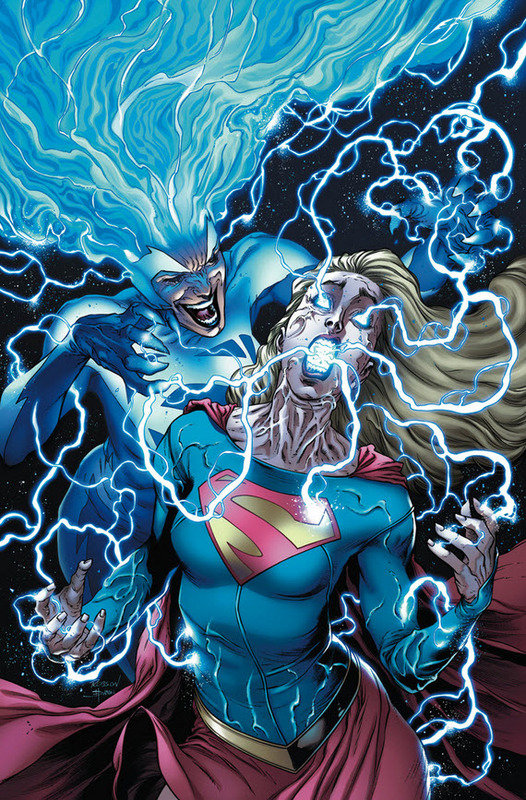 So when Kara needs help tamping down her ramped up powers, I like that she heads to her cousin. And when he sends her to New Super-Man for help, that also makes sense. They are all parts of a wonderful whole. I also love Supergirl's character in this issue. She is trying her best. She is embracing Earth as her home. She inspires people. But she throws down when she needs to. It is all I love about the character. While things are maybe a little 'warm and fuzzy', it works. Especially after the bigger melee feel of the recent issues. This issue felt like a 'one and done' pause which will lead into the newer plotlines revealed last issue. Steve Orlando seems to have a great grasp on who Supergirl should be. I love how he peppers these books with nods to the past and other DC books. The book ends with Supergirl in control of her powers but I doubt Orlando has wrapped up that plot completely. This all works. The art is by Jose Luis, perhaps giving Robson Rocha some lead time for the future issues. Luis' style (with inker Norm Rapmund) is akin to Rocha's. It is fine-lined and very detailed. It is very pleasing to the eyes. 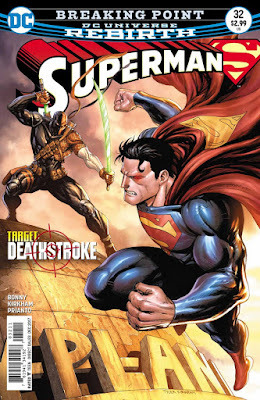 And the covers by Robson Rocha (homaging Jim Lee's Superman #205) and Stanley Lau really leap of the rack. Just a couple of quick hits of things I have noticed that I feel warrant some coverage but not big enough to deserve a whole post. So here are some quick hits! 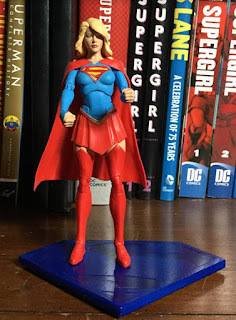 Item #1: Steve Orlando has been bringing a lot of DC history into his books, in particular Supergirl where we have seen Lar-On, Strange Visitor, and other nods to the past. 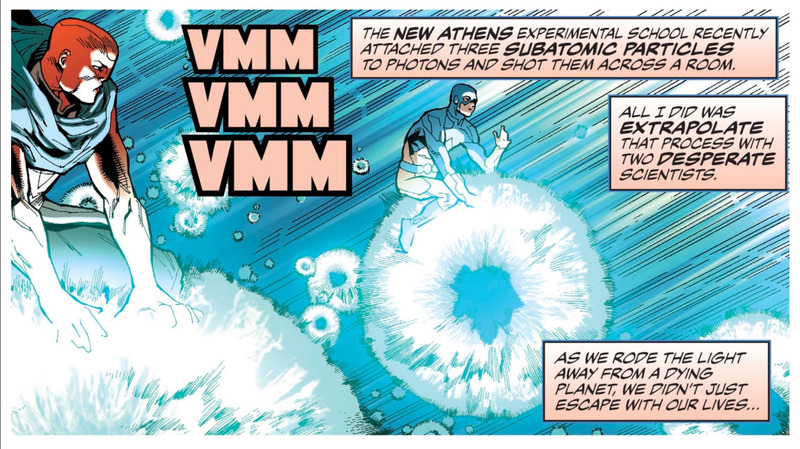 Here in Justice League of America #15 he has Ryan Choi comment on an experiment performed at the New Athens Experimental School. Of course, this was the school where Linda Danvers was a guidance counselor in the Superman Family run. Nice nod to the past! The season premiere of Supergirl Season 3 aired earlier this week. It was incredible. It nailed it. I was floored. This was just the sort of strong start that you want a show to have. The episode was aptly named 'Girl of Steel' as it dealt with Kara dealing with her grief over losing Mon-El by becoming hardened and denying herself any feeling at all. She forsakes her humanity. She embraces her 'alien' nature. But she seems to be protesting too much as every so often Kara shows she is hurting. I probably sound like a broken record but Melissa Benoist is incredible. From subtle intonations of lines to facial expressions to body language, you know just what her characters are feeling. Remember, Kara sent Mon-El to possible oblivion. This was her decision. And she is hurting. We get to see most of the supporting cast interacting with Kara, trying to help her in any way they can, but mostly worrying about her. They see she is hurting. They are giving her space. But eventually, they have to intercede. And while, for me, these character moments were the high points of 'Girl of Steel', the episode also does a great job of setting up the season. We hear about Cat and Snapper. We see Alex and Maggie together again. We get to see how James and Lena have grown in prominence. We meet one of the big bads in Morgan Edge. We get a hint of the bigger bad Reign. And, as usual, we get action sequences and great effects. Overall, this was a brilliant episode, especially with showing just how Kara has to work her way through her feelings. Incredible. 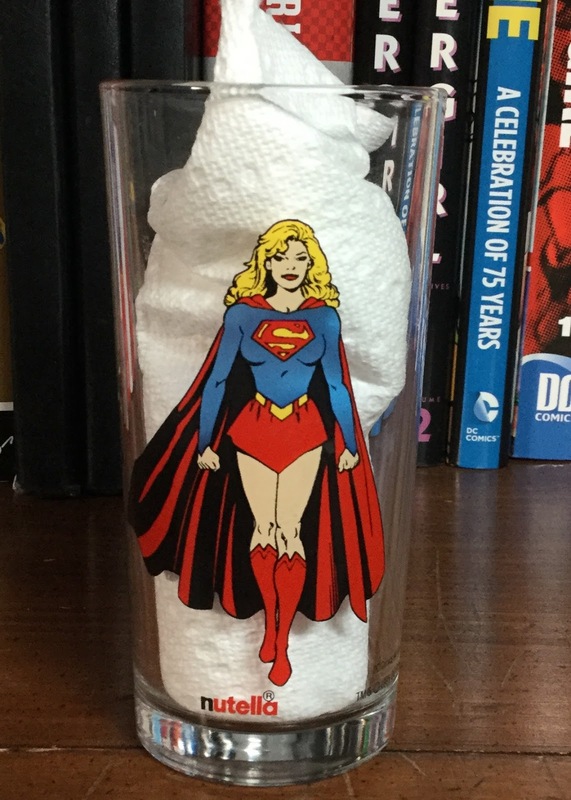 Big thanks to blog friend from Down Under @reading_hix (co-host with @avantgarve of the excellent Waiting For Doom podcast) for telling me about this excellent Supergirl glass from the mid-90s. That most delicious chocolate hazelnut spread Nutella had a series of promotional glasses of DC heroes back in the mid-90s including the then Matrix Supergirl sporting my favorite costume! This series of glasses is quite a time capsule because it included Kyle Rayner as Green Lantern. Paul not only let me know about the glass but was able to find me one and send it my way. I love the rather standard heroic pose here as it highlights all my favorite parts of the costume - full shirt, pointy sleeves, pointy belt, and red skirt. Plus, by putting one foot slightly in front of the other, there is an illusion of Supergirl walking to the viewer. 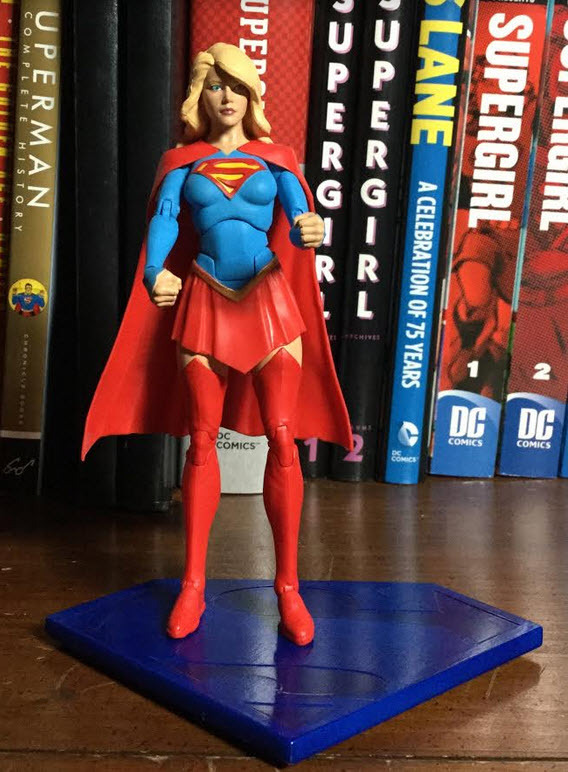 As a big fan of this version of Supergirl, I was thrilled to learn about this and get it for my collection. 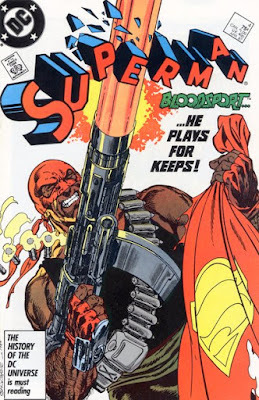 Given that Bloodsport isn't a well known villain, I thought I'd take a look at his original appearance in the comics and why he is actually a threat to our Kryptonian heroes. Back in 1986, John Byrne completely rebooted the Superman mythos. Post-Crisis, Byrne was given the keys to the Superman kingdom. Everything was fresh. The decades of continuity was expunged. No Kandor. No Supergirl. No Superboy. No super-scientist Luthor. There are plenty of places you can read about this at length. But it did mean that these Superman stories felt very new. We saw him meet Lois. We saw him give Jimmy the signal watch. 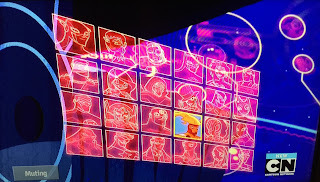 We saw him meet all his villains again ... for the first time! And we saw him Kryptonite for the first times. He had fought Metallo in Superman #1. And here in Superman #4, he fights Bloodsport, also armed with some Green K.
Last month, Superman #31 shined a bright spotlight onto Lois, showing how she works as she tracked down Deathstroke and got the mercenary to open up about his life as a cold-blooded killer. It was a fantastic issue giving Lois fans a story they could sink their teeth into, something that has been pretty rare in recent years. 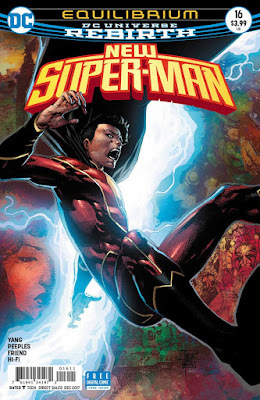 Superman #32, from the same creative team of writer James Bonny and artist Tyler Kirkham, continues that story but shifts the focus back onto the Man of Steel. After an issue of her essentially being a hero, Lois slips into the role of damsel in distress, used as a prop to see if the Terminator can push Superman to an extreme action. The story is fine with a nice little twist ending. The art is great. And had the first chapter not preceded this, I might have liked this more. 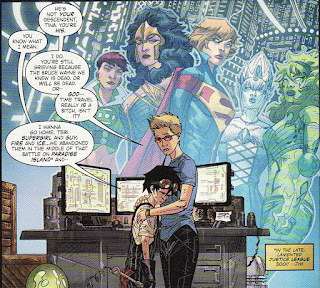 But after Lois starring last issue, this felt a little flat for her. And, I will admit, the characterization of Deathstroke felt a bit more like Deadshot here and so that also felt a little off. 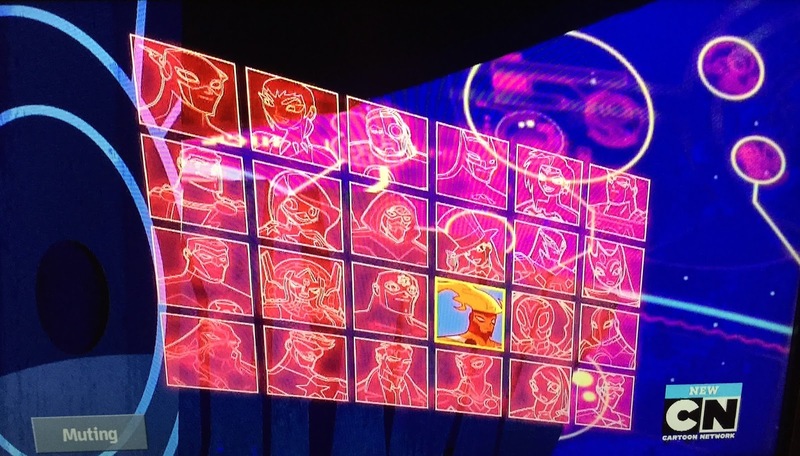 Last Saturday, Cartoon Network aired an episode of Justice League Action titled 'Forget Me Not'. It included this shot of Firestorm perusing the mission monitor board to see which Leaguers were in the headquarters. Check out the team, twenty-four members deep! There in the lower right hand corner, right next to Martian Manhunter is your favorite and mine, Supergirl! Supergirl as a League member makes me very happy! And there is no doubt that is her. 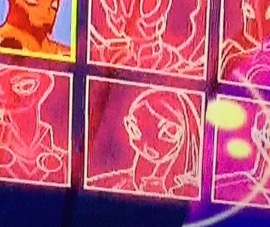 Here is the rough look at her Justice League Action appearance. If anyone isn't watching Justice League Action you are missing out. It is a complete romp. It is a ton of fun. And it includes some pretty deep cuts in the DCU (e.g. Klarion, Felix Faust, Space Cabbie, etc). Now all we need is to actually see her on the show!!! 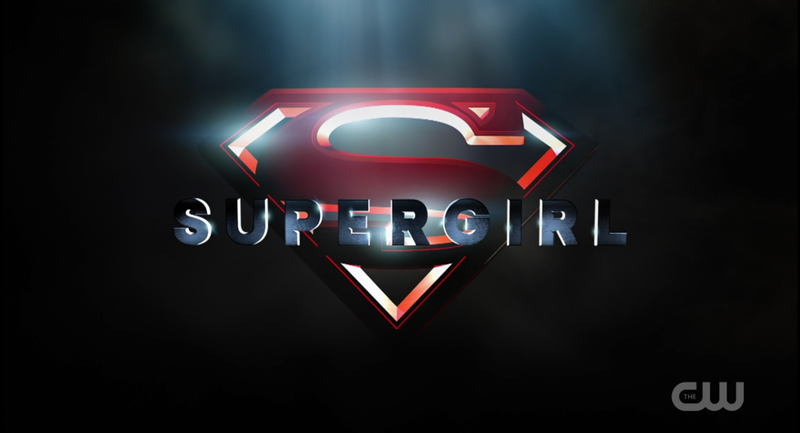 Supergirl on the CW. 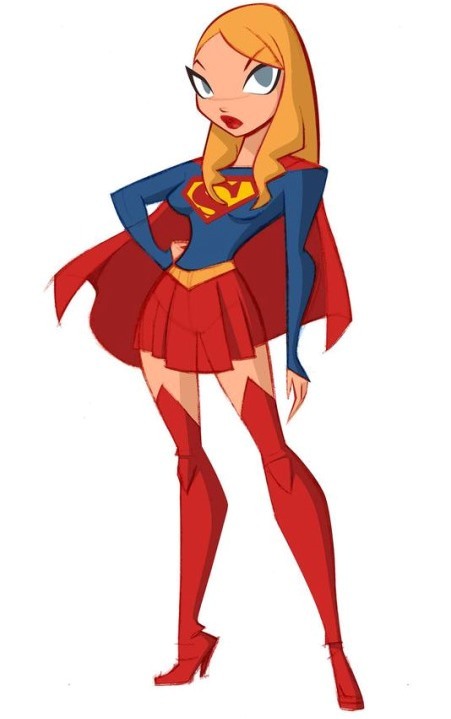 Supergirl in DC Superherogirls. Supergirl in Justice League Action. Seriously, I started this blog because I thought Kara wasn't getting the love she deserved. Now she is everywhere, finally respected! 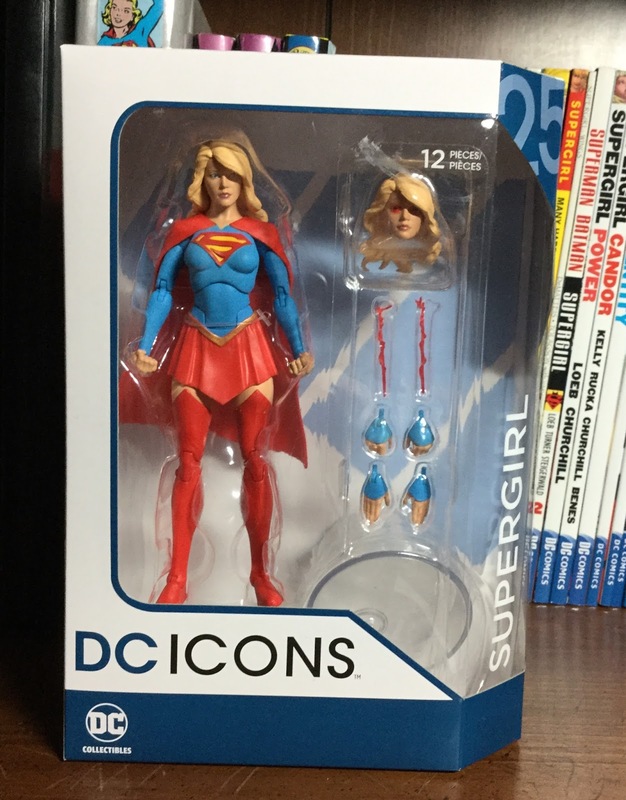 I recently purchased the DC Icons Supergirl figure based on the Rebirth Supergirl costume update. This is a very fun figure with the standard multiple sites of articulation and great sculpt. But this one also has the added fun of interchangeable parts including 3 sets of hands and two heads, one sporting blasting heat vision. The packaging is clean showcasing the figure nicely. And the figure itself is very nice. There is a serious look on the face, consistent with the action pose and fists I chose. I like the pleats of the skirt and the look of the boots as well, high enough to almost resemble leggings. One of the books which I feel was underappreciated and ultimately cancelled was Justice League 3001. 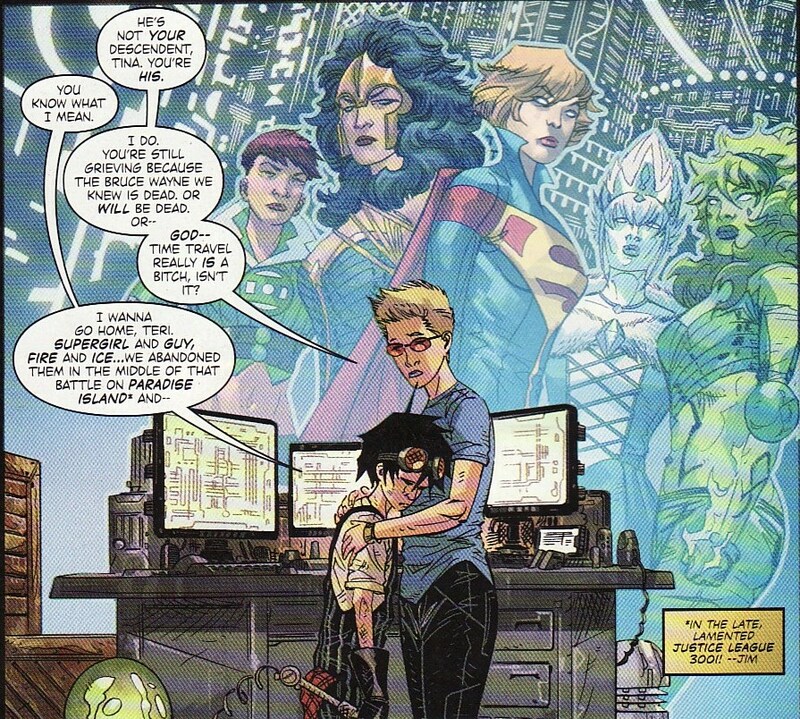 A wonderful stew of action, humor, with multiple universe interpretations mashed into one wild world, and crazy new versions of classic comic characters, JL3001 was great. J.M. DeMatteis, Keith Giffen, Howard Porter, and Scott Kolins brought us an entertaining and electric romp of a book. Moreover, it gave us a very interesting Supergirl, a Silver Age-y Kara who was thrust into a universal war and a leadership role in this League. When the plug was pulled, the 3001 Flash and Batman were pushed back into the present day and were made part of the supporting cast of Blue Beetle. I admit I didn't buy Beetle regularly, but last month we saw the League in a flashback panel. The Flash and Batman recognized they needed to get back to their time and help their team in the fight against Lady Styx. 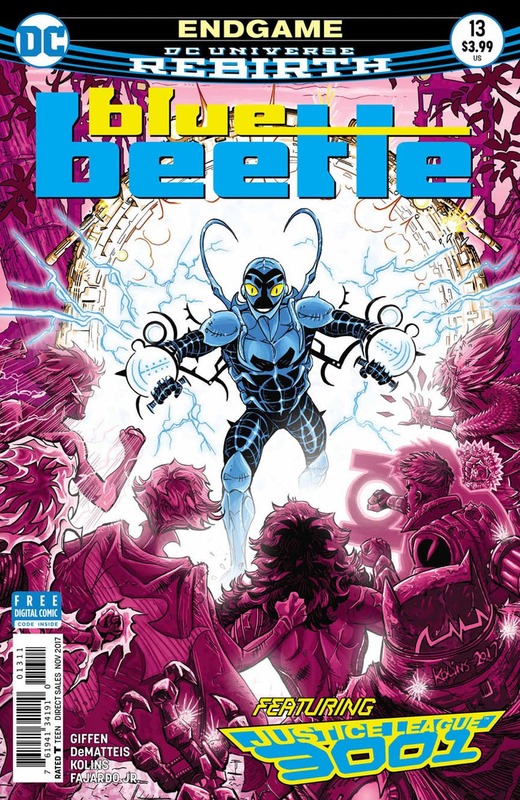 Last week, Blue Beetle #13 came out which truly featured the JL3001 team, even promoting it on the cover dress. This is the last issue for this Beetle creative team of J.M. DeMatteis, Keith Giffen, and Scott Kolins. Maybe realizing this might be their last chance to visit the 3001 universe, this book reads more like JL3001 and less like a Blue Beetle book. That made me happy. There isn't much closure here. The future of the 3001 universe is still up in the air. 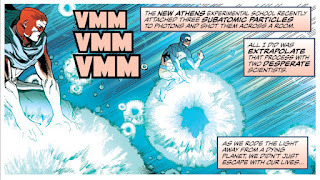 DeMatteis and Giffen do make a solid connection between this book and the primary villain of the 3001 universe. And Kolins brings his usual gritty, rough energy to the fight. But mostly, it was great to see this League one more time. I have missed reading their adventures monthly. The December solicits have come out for DC Comics and it looks like a good month for the company with multiple new titles coming out by big creative teams, Lex Luthor on the cover of the Doomsday Clock with an arm suspiciously similar to Ozymandias' visible, and the continued Metal. I don't know if any of the new titles sound like books for me. I am on board for the Doomsday Clock. But it is the super-titles that we hear to talk about. 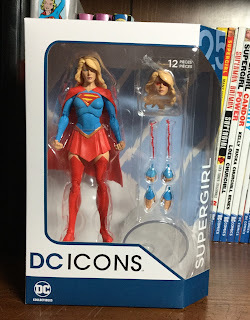 I also have to say that it is getting very expensive to be a Supergirl fan. There is just a ton of merchandise coming out for the Maid of Might. Start saving your pennies! But on to the super-books! I was thrilled when early on in this series, Supergirl was embraced as a hero. People were sporting her shirts and cheering her. So I hope this dark turn doesn't last too long. I love that we'll get more of the Kara Danvers side of the character. A school dance? Awesome. I am surprised there is no mention of Strange Visitor in the solicit as she dominates the cover. And I hope somewhere along the line we hear how Orlando and Houser work together on writing chores. But this sounds very good.